A reflection on elections, voting machines, and our experience with the Libertarian Party. There are undoubtedly many problems with the election process in the U.S. Many of the issues are systemic and beyond the scope of a single company to address. We don’t want to sit around and do nothing, however — the journey of a million miles begins with a single step. America’s voting machines are out of date, insecure, difficult to use, and largely supplied by a single vendor whose vote-counting software is proprietary — i.e. its inner-workings are a secret; there could be code — intentional or not (“a bug”) — in there that adds votes, changes votes, or deletes votes and there would be no way of knowing. “Transparency” is the name of the game for todays governments and corporations, yet it is sorely missing from the election process. That is why we are doing what we can: creating a voting machine for the 21st century, using blockchain technology, open source code, and implementing decades’ worth of suggestions into the design. The process begins with a good old fashioned paper ballot. Paper ballots are not only less confusing than many electronic voting systems, they provide an indisputable audit trail in the event of a disputed election. “Humans need the paper ballot. It’s going to be a long time before a human trusts a computer.” — Nick Spanos, CEO, Blockchain Technologies Corp. The marked paper ballots are then scanned using optical mark recognition (OMR) software that extracts the selections a voter made. The voter is then presented with a confirmation screen that displays their selections. If there is an issue, a new ballot is issued and scanned again. Voters confirm their selection before the ballot is moved to a secure lockbox. The voting machine keeps images of every scanned ballot and votes are recorded using a local (offline) blockchain that timestamps and assigns a unique signature to every ballot. Once the election is complete, all data from the election (local blockchain, ballot images, other ‘metadata’ created by the software) is zipped and burned on to a DVD-R. The “cryptographic hash” of the zip file is made into a QR code and printed on the DVD itself — a process used for decades to verify the integrity of data. After all of the election data has been safely recorded/backed up offline, the voting machine(s) are connected to the internet where they create numerous OP_RETURN transactions via multiple Blockchains (we currently use Florincoin and Bitcoin together) with the election data (and hashes) attached for permanent safekeeping. 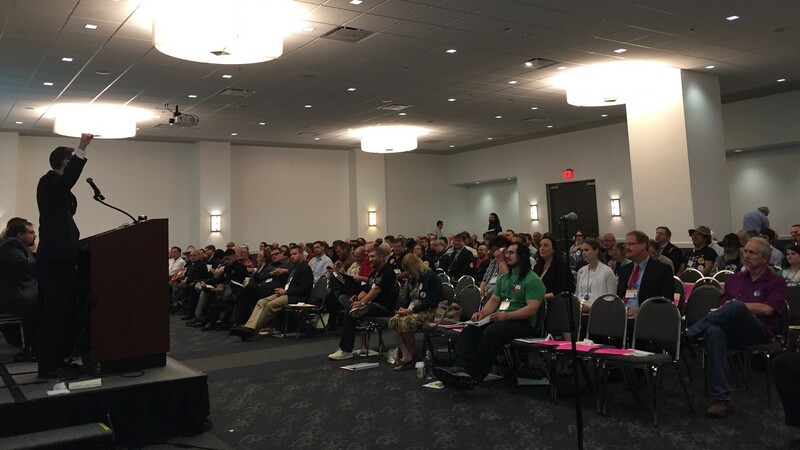 This is the process we used at the Libertarian Party of Texas’ and New York Libertarian Party 2016 State Conventions. All of the election data is available for public viewing at www.VoteUnits.com, our site for posting election results. There you will find all ballot data and results for each ballot we scanned, as well as links to every blockchain transaction containing said data. There is a long road ahead but we are excited about the prospect of bringing increased transparency, efficiency, and trust to the election process. Keep up with the latest developments in our blockchain voting project by following @BlockTechCorp on Twitter (and here on Medium!) and be sure to bookmark BlockchainTechCorp.com. If you have any questions or comments, please post a comment or email info@blocktechcorp.com.